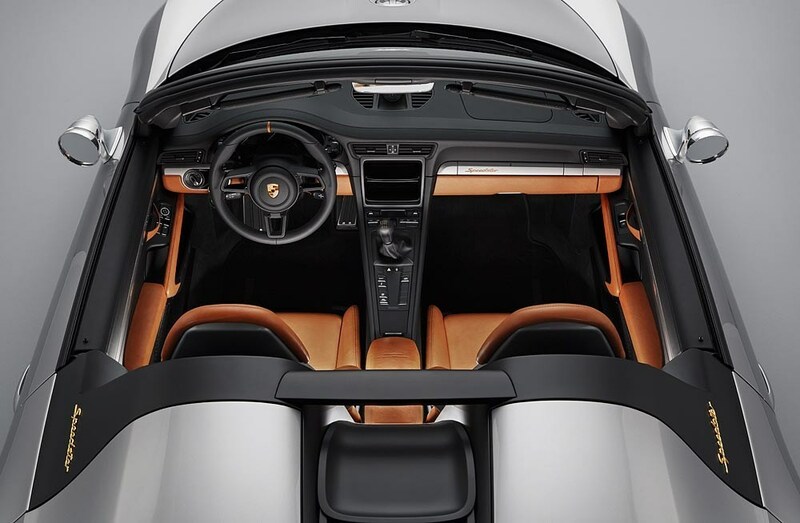 Photo courtesy of Porsche Cars North America, Inc.
Like the historic original, the 911 Speedster Concept also features a lightweight tonneau cover in place of a convertible top. This cover protects the interior from rain when parked and is attached using eight Tenax™ fasteners. The Speedster philosophy also defines the interior, where the navigation, radio and air conditioning systems have all been removed to reduce weight. The Full Bucket Seats are made of carbon fiber, and light brown natural leather in Cognac notices features from the car’s classic predecessors. By 2010, eight different production and special models bearing the “Speedster” name had been created. The 356 A 1500 GS Carrera GT Speedster represented a highlight in 1957, and the first 911 Speedster followed in 1988. Limited to just 356 units worldwide, the 911 Speedster of the 997-generation built in 2010 was the latest model to be fitted with the famous designation. In a special exhibition at the Porsche Museum, the company is now displaying numerous stories and milestones with which Porsche has decisively influenced the development of the sports car since 1948 and continues to do so today, highlighting outstanding Porsche developments over the past seven decades. The sports car manufacturer is also celebrating this anniversary with numerous activities around the world throughout 2018. Tomorrow, June 9, Porsche will be inviting fans to its Sportscar Together Day at all its sites around the world. During the weekend of June 16–17, the sports car manufacturer will host employees, residents of the Zuffenhausen district and prospective customers at a celebration in and around the factory in Stuttgart. Established in 1984, Porsche Cars North America, Inc. (PCNA) is the exclusive U.S. importer of the Porsche 911, 718 Boxster and 718 Cayman; Panamera; and Cayenne and Macan. Headquartered in Atlanta, Georgia since 1998, PCNA is also home to the first Porsche Experience Center in North America featuring a module-based 1.6-mile driver development track, business center, and fine dining restaurant, 356. The company operates a second Porsche Experience Center near Los Angeles.